Posted by Martin Koser on 20. January 2009; This entry is filed under Design and more, English posts, Innovation et al., Strategic Thinking. 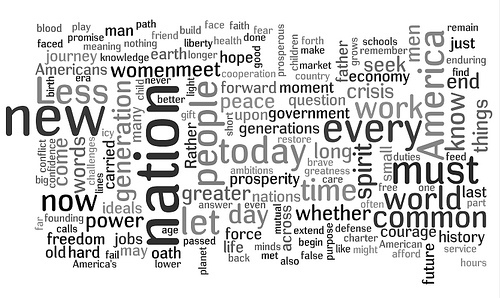 While this is an interesting perspective of Barack Obama’s inauguration speech (wordle courtesy of Emily Chang) and it was impressive, the real action is here: great agenda for change, heck doing the www.whitehouse.gov/blog thing at all.